This is amazing to me. 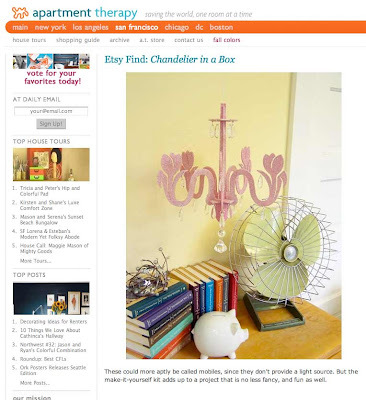 Apartment Therapy has put my Chandelier in a Box on their site! The irony is, I just found this amazing website on Tuesday and put it in my inspiration bookmark folder. 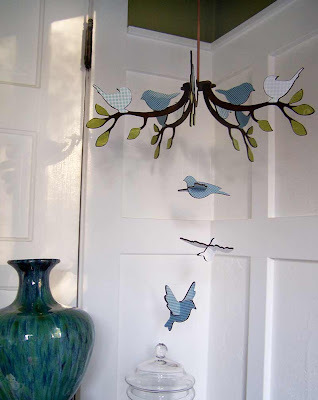 In fact, I think I found the picture of my previous post on Apartment Therapy. I'm so pleased, what a nice Halloween treat. 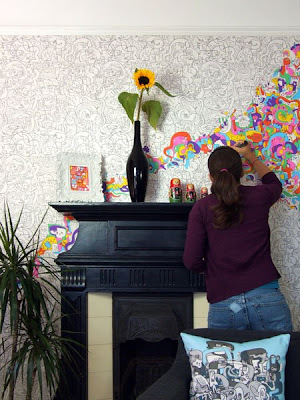 I would have loved this wallpaper in college. 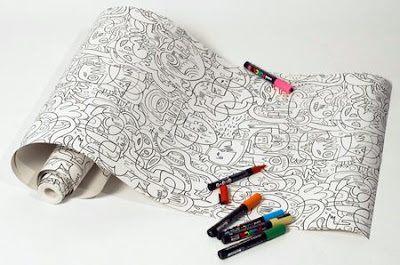 Jon Burgerman has some pretty fun illustrations and kind of a cool name. Just call me Burgerwoman from now on please. So I guess the 2008 Quilt Market in Houston just ended. Maybe it just began or is still going on. Regardless, I'd really like to go one day. The amazingly beautiful fabrics people design are so fun. And they are so much more amazing now than when I used to make quilts. I love sounding like I've made loads of quilts. I've made two and another two are in my cupboard barely started from oh about 7 to 10 years ago. One of them is an amazing snowflake pattern that I'd like to throw away and choose new fabric for. 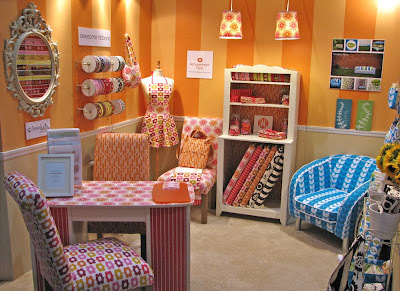 Jessica Jones (fun blog) had fabric displayed in a booth for the Quilt Market and it is so vibrant and beautiful. The booth even won an award for Best New Booth. I had to show it here. Yaa, I've had my first sale for some lucky girls and their bedroom at Lake Tahoe. Their mom will get to decorate the Sweet Tweet for them. Seriously though, this comes from a good luck charm Holly, who posted them on her blog. I think I'll keep her around. After a long wait, she has created a great new set of stamps which can be found here. I stole this card from her blog to post. Isn't it cute. 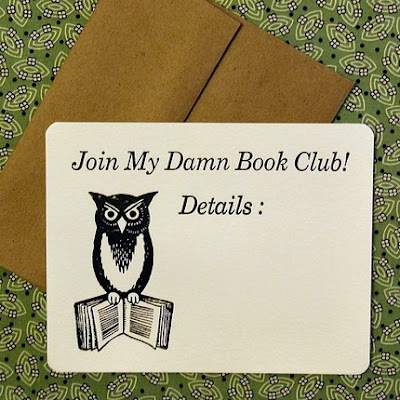 Who could refuse this invite. 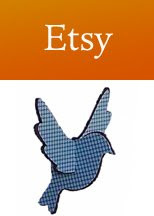 I saw this on Etsy tonight and think it is just so beautiful. It's interesting too, because Amanda (a carpool buddy) and I were talking about non-traditional wedding rings and why more people don't explore different options and then I come across this. 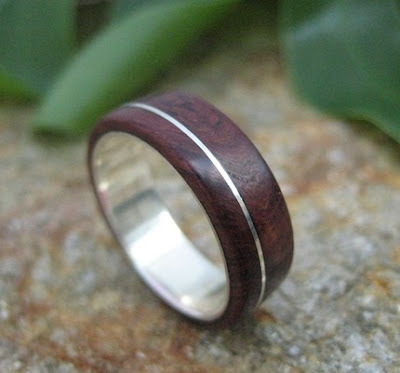 Any man would look good in this ring. Or not so big, but what a relief. A person isn't meant to stay away from the TV so long. Oh TV, I hear you babbling in the background. How I miss thee. 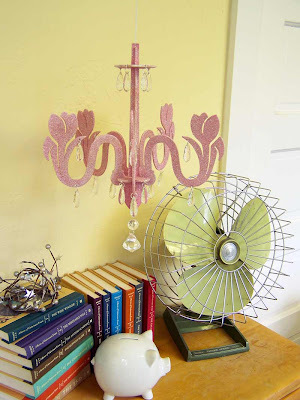 Introducing the Chandelier in a Box Kit, now in my Etsy shop. They're so great for very creative people. I love them and have many more in my head to design. So, if these sell, I'll make more, if these sit on my shelf gathering dust I have gifts for a while. Either way, it's good news. 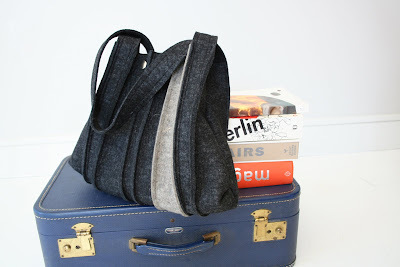 I need to find a different blog because I wish these pictures were bigger, but blogger limits my size. Oh well. And I wish the glitter glittered more in the photo, but what can a girl do. But let's not forget Jasper . 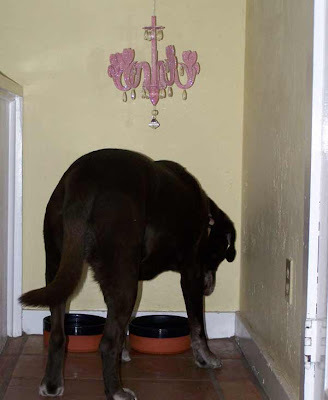 . . you say dry kibble, he says fine dining. So, I've been working on a project for almost a year and who scooped me? Martha Stewart of course! It's almost enough to take the wind out of one's sails. However, my chandeliers are different and I'm really in love with them, so I'm carrying forward. 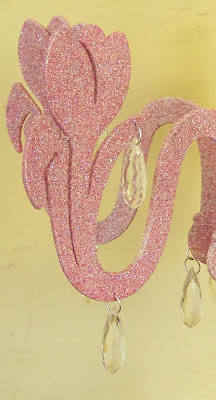 Here is a sneak peak of one of the chandeliers / baby mobiles coming to an Etsy store near you. If I'm really good it will be there Monday night. I've never felt the feeling for felt that I have felt this past year. Feeling luxurious felt for the first time feels . . . fabulous. Not to mention the fuzzy forms it can formulate. Felt says, "Feel free to fondle me." (in a good way). 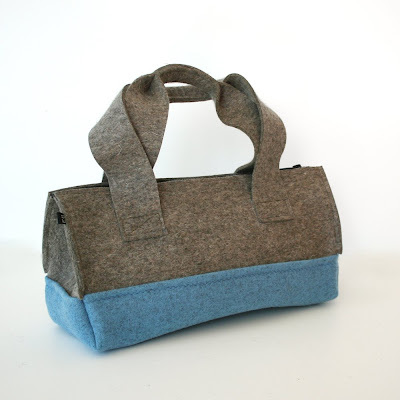 I have fallen in serious felt love with these bags by Etcetera Media who also sell some of their products at Supermarket a very cool online market. I wish they were less expensive. 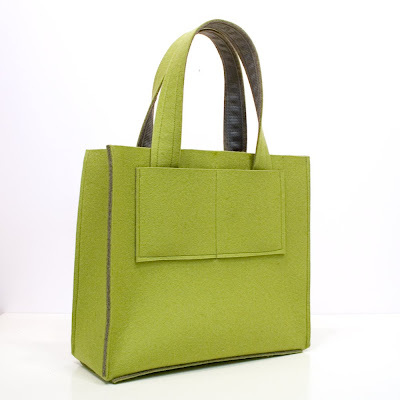 I have a hard time spending inordinate amounts of money on bags. I'm going to have to figure out how to make them myself. Which is why I never have anything very cool, because I never make it. Or if I do, it basically looks like crap. Like the curtains that are hanging in my bedroom half made. They've been that way for 2 years. But at least the neighbor can't see me now.